9x12, xv + 121 pp. In an era when few women attempted to forge careers as professional musicians, Elfrida Andrée (1841–1929) persevered. In addition to serving as the first female cathedral organist in her native Sweden, Andrée composed prolifically throughout her lifetime. Her works range in scope from individual lieder and piano character pieces to cantatas and symphonies, and suggest diverse stylistic influences, including her teachers Ludvig Norman and Niels Gade, as well as the music of Richard Wagner and Claude Debussy. Unfortunately, Andrée published few of her compositions during her lifetime. The appearance of Andrée’s works in modern editions will allow for a more comprehensive understanding of musical activity in nineteenth-century Scandinavia, as well as a richer appreciation of the roles women composers throughout Europe played in shaping the musical landscape. 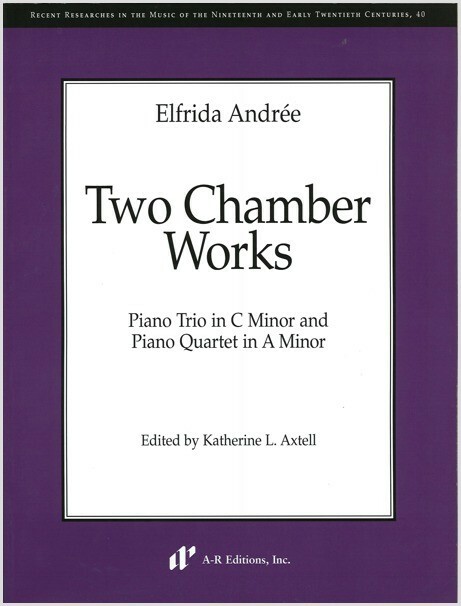 This edition presents Andrée’s Piano Trio in C Minor (1860) and Piano Quartet in A Minor (1865; revised 1870), two important works from the early years of her career.